The purpose of street lighting is to assist drivers, pedestrians, and cyclists in finding their way in the dark. Many neighborhood groups believe that extra illumination helps prevent crime, and business district lighting also may help create a pleasant environment. If your community group is thinking of adding or replacing some lamps (as the sales and technical people call them), this page will give you an overview of the considerations. Photocells now turn most of them off and on according to the actual amount of available light, so we've come a long way since lamplighter days. Now we rely on high intensity discharge lamps. LED lighting is coming on strong for focused lighting situations, due to its energy efficiency. However, you'll still find many various types of fixtures in use now including the older mercury vapor, sodium vapor or high pressure sodium, and metal halide. Street lighting is not actually aimed at showing the way directly ahead of the automobile; the car lights do that. But it does illuminate adjoining areas to alert drivers to the emergence of possible hazards from the side. Pole height is extremely important in the way that light is distributed, so transportation engineers typically want to mount the lights higher on higher-speed roads. To be safe for drivers, light needs to be relatively constant. We know our eyes adjust faster to going out into the sun than to walking into darkness. For awhile when we enter a dark room, our vision is impaired. Driving from a well-lit area to a dark one produces a similar effect. So ideally if an area must be illuminated, the globes are mounted on high poles fairly close together so that the light stays constant, and the eyes are not continuously readjusting for different levels of brightness. For pedestrians, the goal often is illuminating the walkway itself. Extra dark spots along sidewalks can be created by a variety of conditions, including trees, rows of large shrubbery, odd angles of the streets, parking patterns, a tall church steeple or other building permitted in a residential neighborhood, or a host of other potential influences. Keep in mind too that as the popularity of bicycling swings upward, you'll need to monitor the impact of the presence or absence of lighting on those new bike lanes. Often in areas that seem more crime-prone, people will demand more and more lighting. In fact, uniformity is much more important than brightness. The high light level can cause glare, whereas a consistent but lesser amount of light increases perception of safety. The distribution of light on the surface of buildings can increase perception of safety in business districts. Research isn't definitive on whether very high levels of street lighting actually deter crime; one can find results to support either argument. Nevertheless, many community groups are convinced that lighting is part of their crime-fighting arsenal, and if that sentiment is strong enough, it may be part of the answer. Street lighting is often used for aesthetic reasons in a business district, and sometimes in residential areas as well. 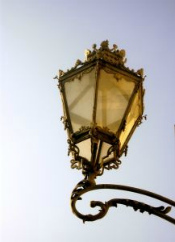 To complement the appearance of an historic district, for example, period fixtures may be selected. Lighting also may serve to accent a particular monument, fountain, or landmark more than to assure vehicular or pedestrian safety. Poles and lamps each may be quite decorative, or modern and minimalist in their design. Boxy lights are common at discount store parking lots, but elaborate 19th century looks are typical of older business districts. Metal halide lamps make colors look more natural, and thus are particularly preferred in business districts. High pressure sodium casts the eerie yellowish glow. Some designers prefer one color effect over another, just as at home you choose between bright white and soft white depending on the mood of the room. If you have the financing, or can require developers to provide the financing, for underground burial of the wiring, the aesthetics are much better than above-ground wires. In fact, whether or not new fixtures are purchased, the expensive process of burying the wiring often is a valuable turning point in improving the aesthetics of a shopping district. There is often a tension between the height of the poles and the desire to illuminate pedestrian spaces with the same system used to enhance the driver’s experience. It's possible to add new period lights for the pedestrian and maintain the older and higher lights for the driver. The period lights may even serve more as a daytime decoration than as a serious source of light for nighttime. I think retaining the old lights detracts somewhat from the appearance of the new streetscape, but you may have to satisfy the traffic engineers with this compromise. The typical older fixture, which you might hear called the "cobra head," is 30 or 35 feet high. But for decorative and pedestrian-oriented installations, the manufacturer will supply suggested heights and spacing. Remember that uniformity to the extent possible is the goal. We think street lighting should be required as new subdivisions and residential districts are developed, and that the wiring should be required to be buried underground. We are being consistent with our theory that a walkable or bikeable community is highly desirable. In existing residential areas, the preference of the residents is often the most important factor. Some neighborhoods feel safe and semi-rural, and illumination would only serve to annoy residents unless it is imperative for driver safety. Even then, specific drop-offs or other roadside hazards might better be highlighted through use of simple reflectors rather than an elaborate street lighting program. In many locations, residential street lighting is added and bulbs are replaced only when residents complain. Often you can pay for the installation through a special assessment, a voluntarily assumed tax on a defined group of residents and/or businesses. The special assessment would be in effect for a specified number of years, and typically paid off monthly as part of the utility bill. Of course a special assessment that is paid monthly or annually "runs with the property," meaning that if a house is sold, the next owner is liable also. Special assessments on a one-time-only basis also are legal in some states and situations. For residential streets, the recommended interval between fixtures is often every 400-600 feet, but it's more practical to take local climate and tree cover into account before determining this. The color and reflectivity of the street surface also matter. Decision-making, and therefore conflict, about what to do when the distance isn't easily divisible by the recommended interval is common too. So be prepared. Electric utilities, which sometimes are municipally owned, typically play a major role in street lighting in communities. The utility may even offer you a menu of choices and tell you these are all the lights that are available to you. Of course, other options usually can be made acceptable, but be prepared to pay the price, both economic and in terms of time and effort required to persuade the utility to change its ways. If you need or want replacement street lighting, it's also worth asking the utility to share in this cost. Many utilities will have a favorable policy if the older lights are more than a certain age. Why ask for new street lighting? A newer street light will probably be more energy-efficient. Also dilapidated or leaning poles or fixtures detract from the appearance of a neighborhood, even during the daytime. It's also common in some parts of the country for municipalities, homeowners associations, or other entities paying for street lighting to be able to lease rather than buy the fixtures from the utility. If you lease, you're almost certainly going to be limited to the utility's selection. Sometimes municipalities will maintain their own street lighting, and sometimes that burden is assumed by the utility. And it's possible the utility will offer choice too. In some parts of the country private companies sell the service of maintaining the street lighting, including bulb replacement. Light pollution (unwanted light in the sky in general) and light trespass (unwanted light that shines on adjacent properties) also are increasingly important concerns. If light trespass bothers residents, expect complaints. In the last 25 years or so, great progress has been made in providing highly directed street lighting that does not spill over onto unwanted areas. If you need to retrofit older street lights to solve problems of lights shining into bedroom windows, directional shields are available at a much lower cost than replacing an entire fixture or street of fixtures. Some towns and cities have so-called dark sky ordinances, requiring street lighting to be highly directed, not spilling over into the sky. Manufacturers also are rising to the occasional by producing night sky fixtures. Mercury vapor lights are quite inefficient in their use of energy. And of course the type of luminaire (we would say "globe" at our home) that we use can dim the light produced by the bare bulb and therefore result in energy inefficiency. Solar fixtures are now available for towns and cities wishing to be more sustainable or eliminate the ongoing cost of electric street lighting. In terms of operational cost, though, there are additional considerations, including how frequently bulbs have to be replaced, what happens when a car hits a pole, and the projected life of the entire fixture. If maintenance requires special equipment that your neighborhood or town does not have access to, any costs for necessary equipment must be factored in. We want to alert you to the fact that cities are beginning to think about other ways to take advantage of street lighting poles. The poles tend to be less cluttered than utility poles, and yet can offer the same advantage of height and pervasiveness. Once a community contemplates a smart lighting program, in which some type of sensor regulates the light, an internet connection is required. The sensor then could lead to collection and transmission of video feeds from security cameras, construction of a public wi-fi system based on the existing internet requirement, supply of broadband internet in disadvantaged areas, monitoring of traffic and coordination of traffic signal timing, collection of weather or air pollution data, or even coordination of autonomous vehicles, popularly known as self-driving cars. If your community could do a better job in any of these arenas, plus you have or are expecting to install some smart lighting, exploring those additional possible uses of the poles could be important. 1. After an appropriate amount of community outreach, agree on the reasons this is important to the community. 2. Determine how street lighting is purchased or leased, and how it is maintained, after consulting with your particular municipality and with your own utility. 3. If you are replacing older lighting, see if the utility or municipality will cover all or part of the cost. 4. In an existing residential area, the preferences of the residents should weigh heavily. 5. Decide whether the architectural appeal of the lighting fixtures is important, whether the lighting is to benefit primarily drivers or pedestrians, whether the illumination of adjoining buildings or monuments is important, and whether the lighting serves a crime prevention purpose. If community beautification is your goal, do not skimp on quality. 6. Discuss how important accurate rendition of color is in your location. 7. Investigate the choices, their installation costs, and their operational costs. If you aren't limited by choices already made by the utility, salespersons in this field actually can be enormously helpful in narrowing the range of appropriate lighting systems.